Stockholm was ny 3rd concert on this tour, and my 21st overall. The other two were Hamburg and Munchen. 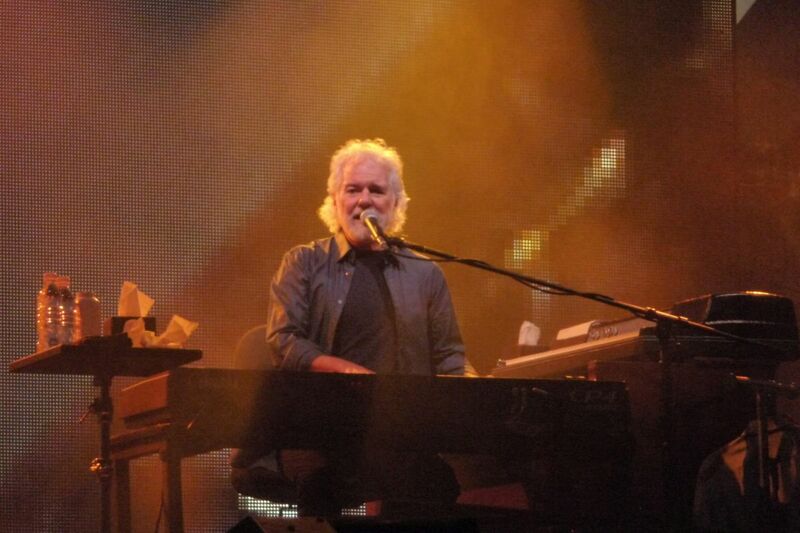 I loved both Hamburg and Munich, but several concerts later in the tour they are now tighter and more relaxed. I had a great view, standing in the pit on Ronnie's side. 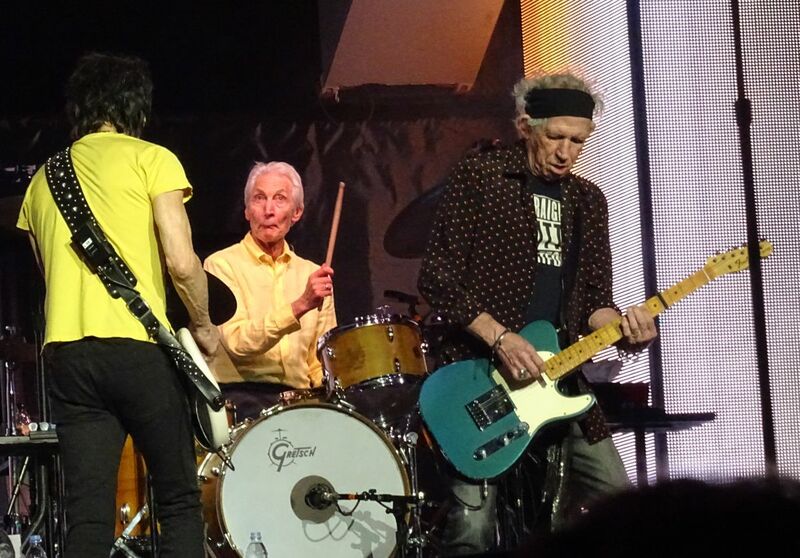 Great concert, I found it a little slow in the beginning, but from Tumbling Dice on it rocked and the band had woken up They seemed tight, in good spirit, lots of smiles and performed well most of the time. 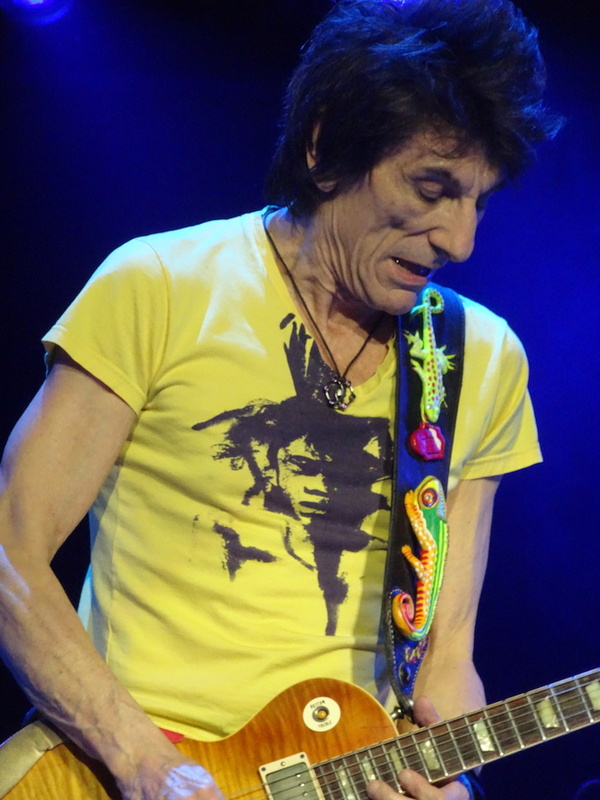 After Miss You, we got a very good and long Midnight Rambler, where Mick kept Ronnie going on and on near the end. You could see that the band enjoyed this ( and so did I). JJF always rocks, one of my concert favorites. 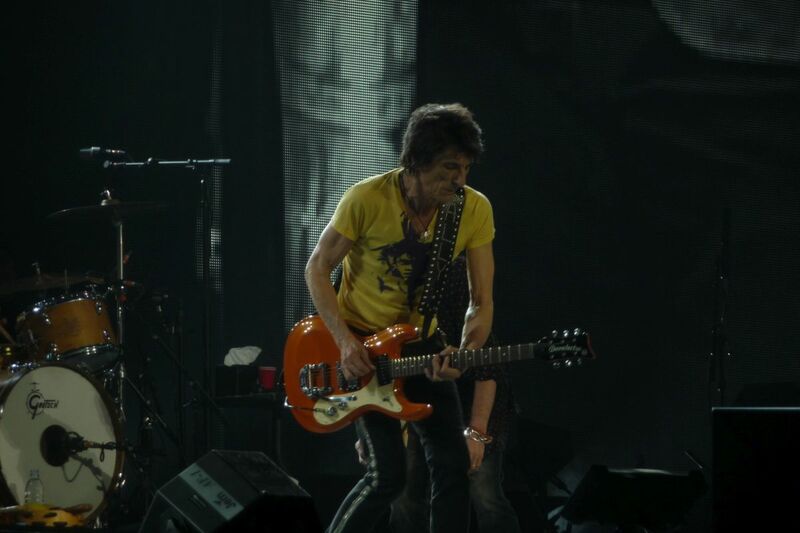 I love the the sound of the opening riff cuting throught the air like a razor blade As the first encore we got a really, really good Gimme Shelter with a great performance by Sasha (by all, actually). The best of this tour? Rambler and Shelter were in my opinion the highlights this evening, followed by Paint It Black. This was my last concert on this tour, now I look forward to UK next year. What a great concert! I don´t want to commend on every song. The Stones played the normal, and of everybody expected, setlist for the No Filter Tour. The two special songs for today were „Under My Thumb“ and „Sweet Virginia“. I came to Friends Arena with a normal ”front of stage” ticket but I could make it to upgrade my ticket to ”pit”. 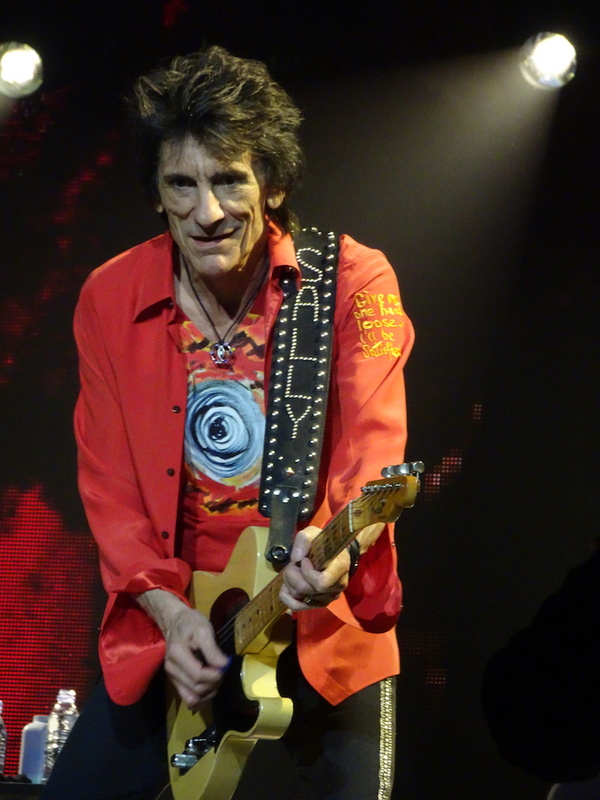 Only 10 meters to the stage on Keith´s side.It was it worth. It was my 13th Stones-concert and just everything was just fine today. The sound was great and the way they performed was on a very very high level. 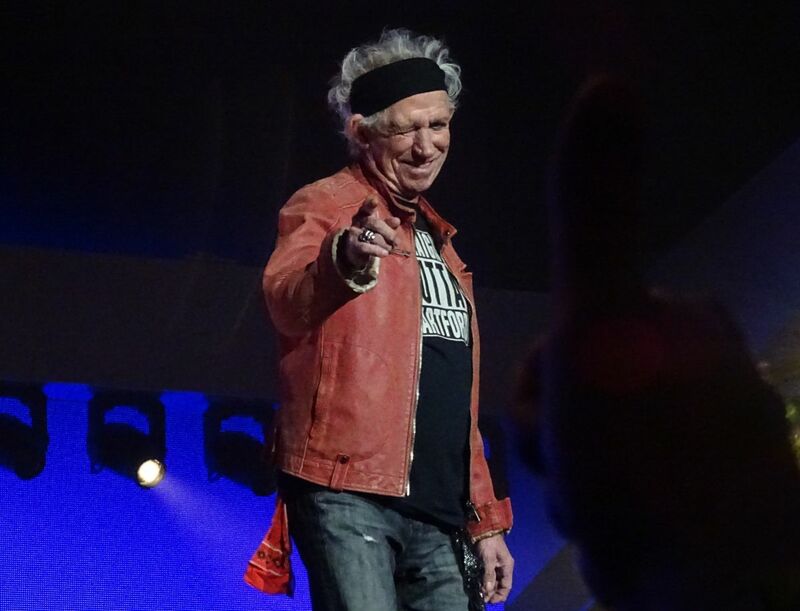 Keith was giving signs for the band with his foot when to finish a song, raising his hand … and everything worked. In my opinion this concert was a 100% +++ concert. For those who want to compare this concerts with other concerts: The only conclusion is: this concert was not worse compared to other concerts I have seen. 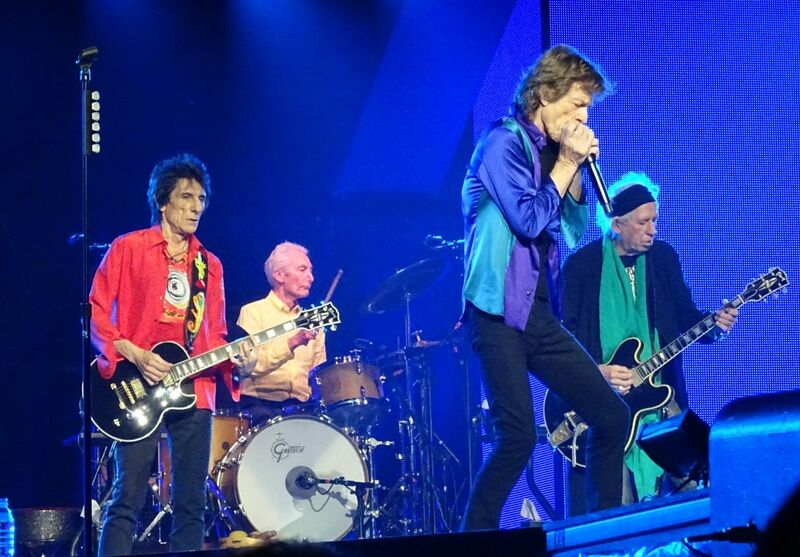 A friend of mine, who has seen the Stones since 1966 joked: the first time that everyone in the band was sober. I agree. 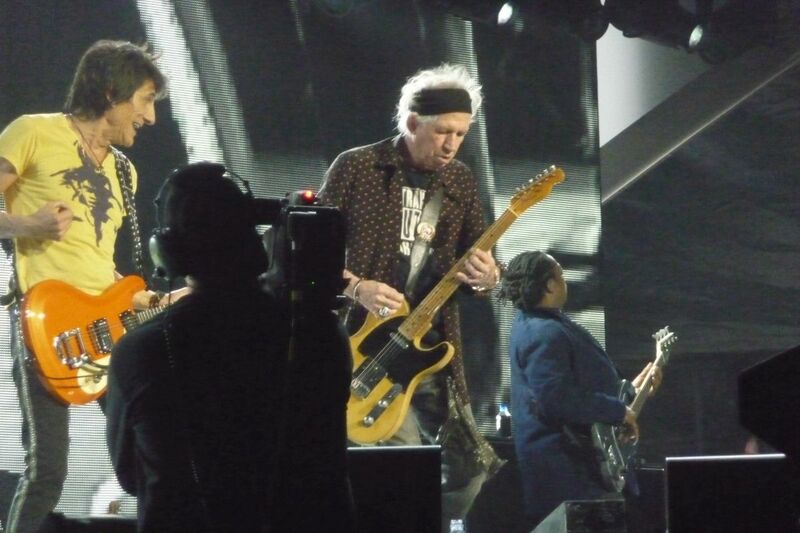 Thanks Rolling Stones for this special night. Everything was just perfect! My problem is right now: can I make it to more No Filter concerts? Right now I try to ”land” again! I admire everybody who can make it till Arnheim or Paris. This band will last forever! 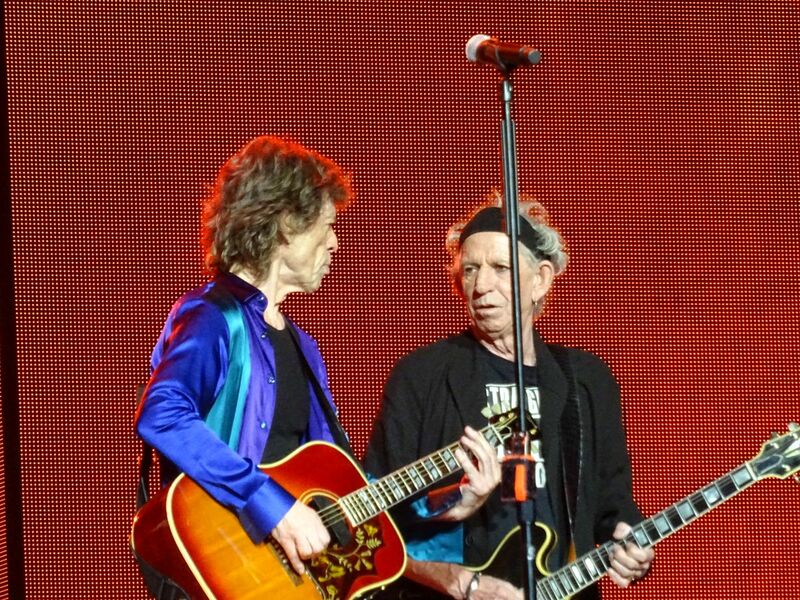 There was a section of this show, starting with Under My Thumb, that must rank as one of the most exquisite I’ve seen the Stones play, club-gigs and their rarities excepted. The current arrangement of UMT is certainly as good as the 1966, 1969 and 1981/2 versions. The gentle swaying rhythm; the marimba-sound from Chuck’s keyboard; the guitar licks from Ronnie and Keith; the vocal expression from Mick. A beautiful version, the second time I’ve heard it this tour – and it is getting even better. It could migrate into an almost tropical feel soon. Coming-up next the song vote delivered us Sweet Virginia, to the delight of at least one fan we know. 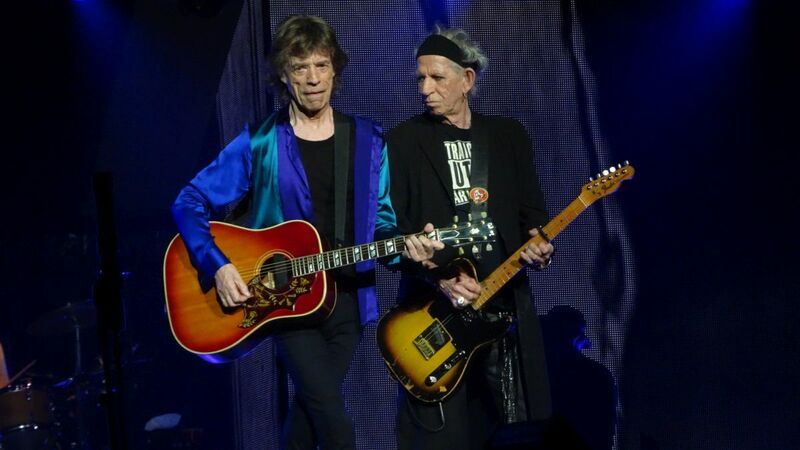 I think on some previous versions this had Keith playing acoustic; tonight he was on electric, playing those little runs that link the verses on the Exile original: and playing them with fluidity and accuracy. 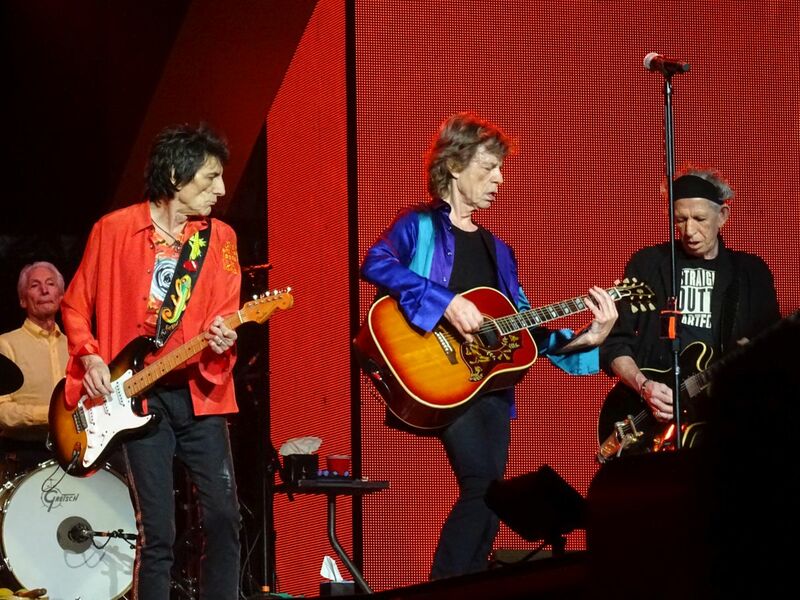 I could hear plenty of Mick strumming his acoustic, gentle brushes from Charlie, Ronnie adding country-style licks, and some delicate piano from Chuck. The sax solo from Tim really completed the ensemble – a second beautiful “uncommon” song in the set list. 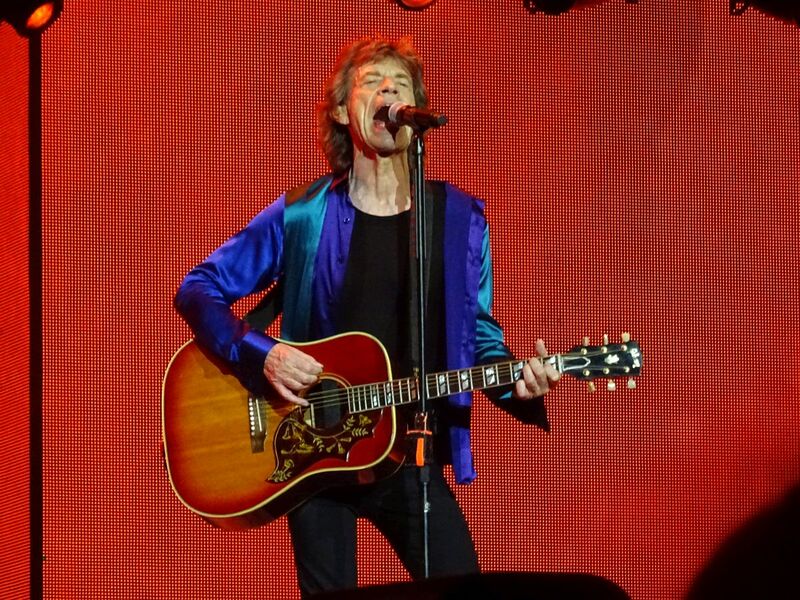 Mick then, unusually, kept hold of his acoustic for YCAGWYW. 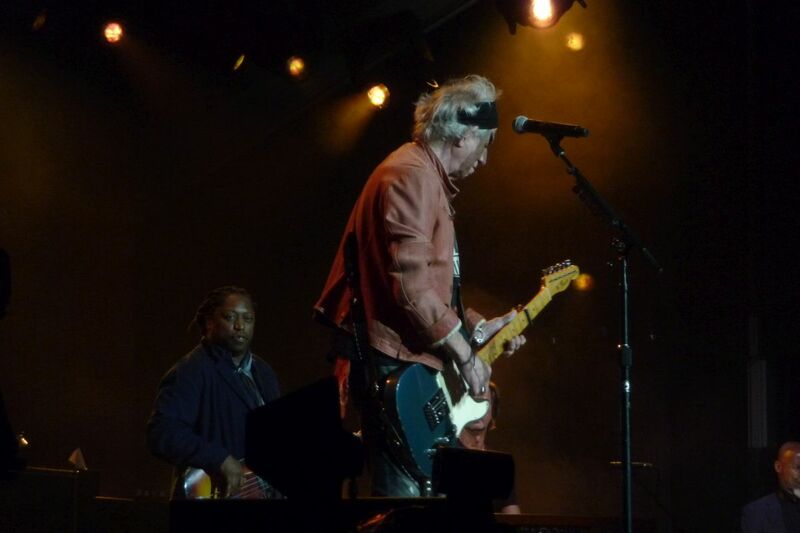 I now much prefer the no-choir start, although it worked well for several years, just the classic riff from Keith that we’ve heard since the ’72 tour. 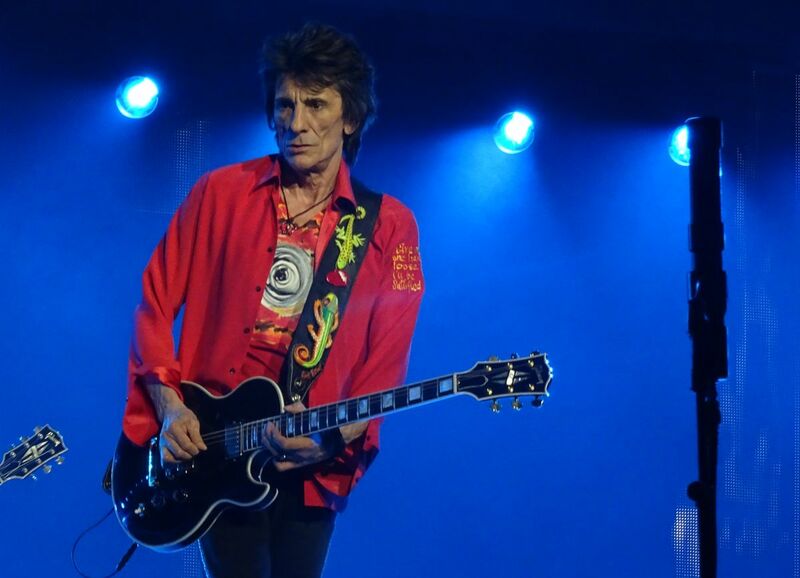 A great solo from Ronnie to complete the third and last song of this section of the gig. Absolutely fantastic. 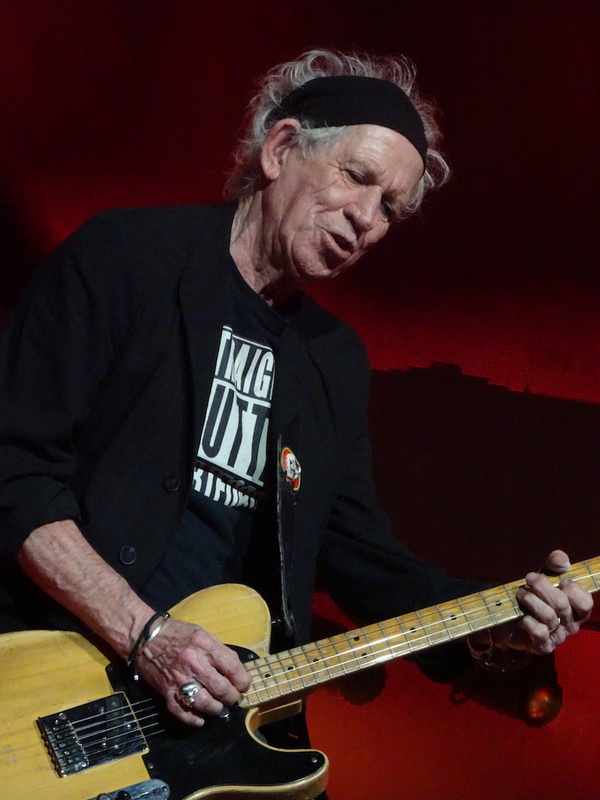 In fact I thought the whole set, up to and including Keith’s songs, was extremely strong. 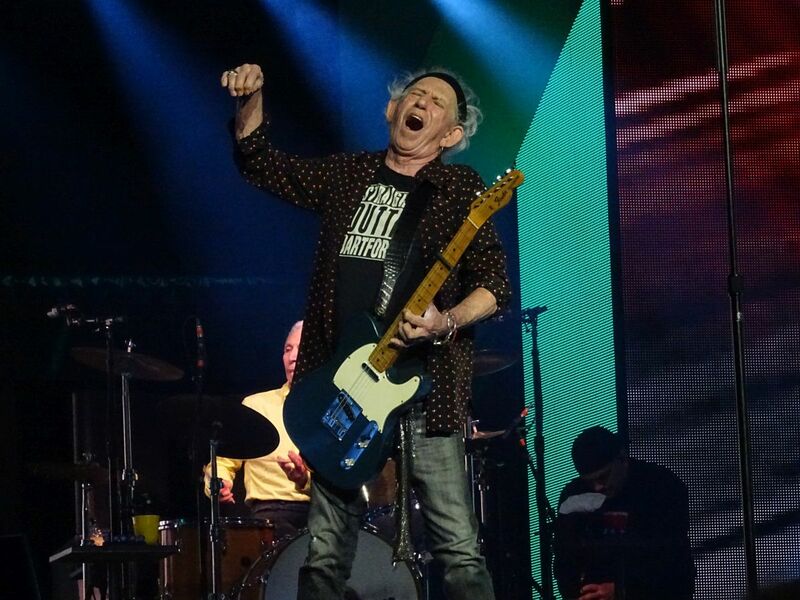 Lots of energy on stage; the band clearly enjoying themselves; at this stage in the tour the machine is very well oiled and running smoothly and revving hard when needed. 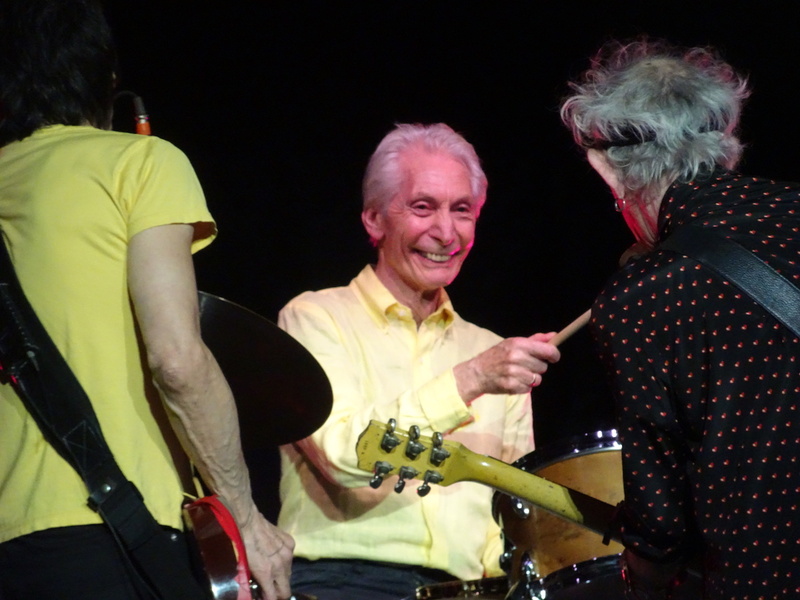 It seemed like the band were having lots of fun, with smiles and jokes all around. The Swedish (and Norwegian, and Finnish, and many other country’s) audience helped by their enthusiastic reaction to the performance. Mick made some comment about “better than the last lot” which I assumes means he didn’t rate Dusseldorf’s interaction. Strangely the seated sections seemed mainly fixed to their seats. I don’t think the distance from the stage when the floor is big enough for football helps connect them with the band. A Hockey arena always seems more intimate. This may explain why at least one Swedish paper suggested that it was time for the band to call it a day. I’m not sure many of the audience would agree at all. Having said that the band introductions seemed a bit muted, and the whole band seemed to lose just a little energy towards the end. 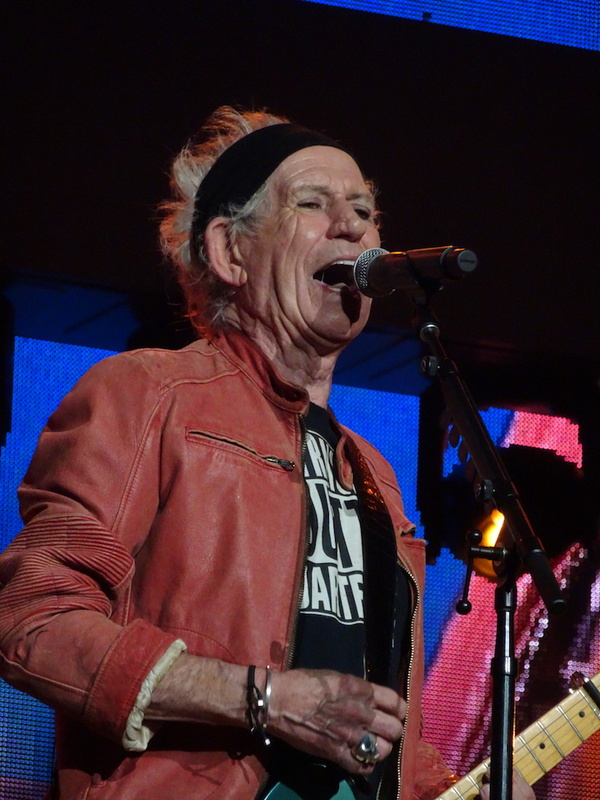 Someone close to the stage thought Keith might have strained a knee: he certainly sat down more than I’ve seen before, dragging very deeply in a cigarette – not what you’d expect from someone who is tired. Maybe the pace and standard of the first part of the set took it’s toll. Don’t misunderstand me, I’m guessing few except the so called “super fans” would have noticed anything at all. 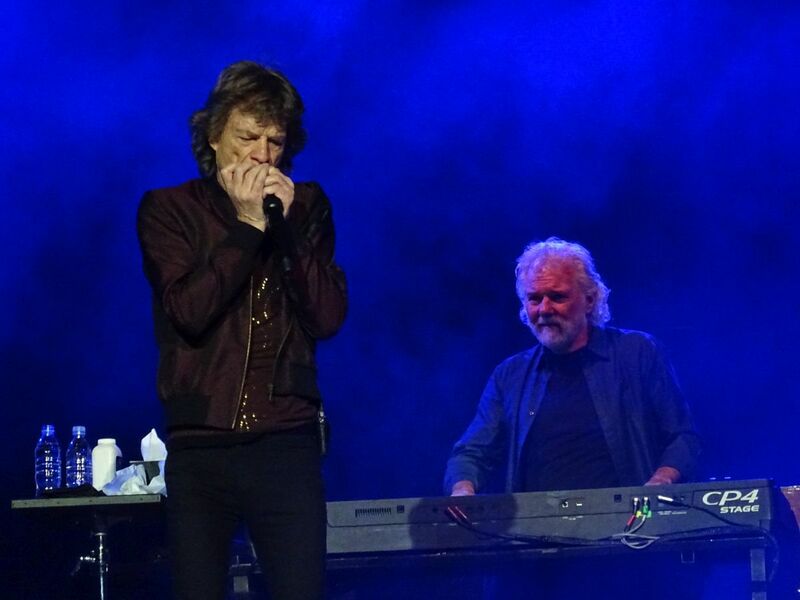 Perhaps being well into the tour also means that whilst the performance has tightened-up a lot, and the whole band is back to being mates enjoying playing their blues and rock, the weariness of travelling and entertaining is tiring for these guys. Its not surprising. Few of the audience of whatever age could do it for weeks on end. The “big four” end-up being locked away in a hotel, it being very hard to get out and about without plenty of planning. Its tedious and boring; it’s living in air conditioning; it is like being a hermit. I saw a couple of the more well-known members of the wider band leave their hotel as I walked-in, and they were immediately pounced-on for autographs, and someone was videoing them from pretty close-up. Relaxing it certainly is not. 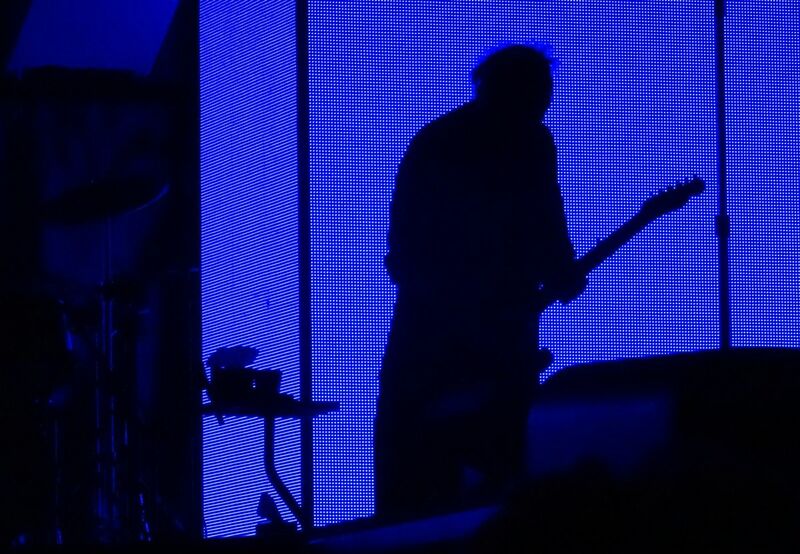 Looking back to the rest of the show, it really reinforced my opinions over the three previous gigs I’ve seen on this tour. Some of the music is feeling a bit more jazzy, a little more loose, more flexibility in arrangement. 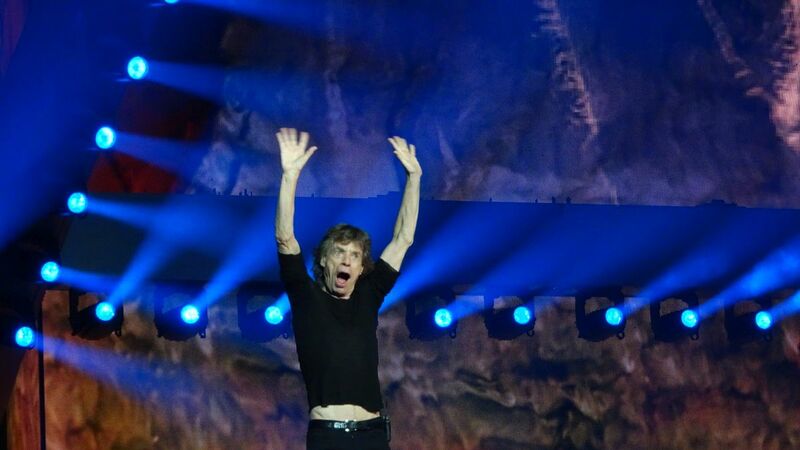 Ok this is occasionally when someone forgets it, or like in Rambler in Stockholm, when Mick was extending the arrangement from the end of the cat walk. 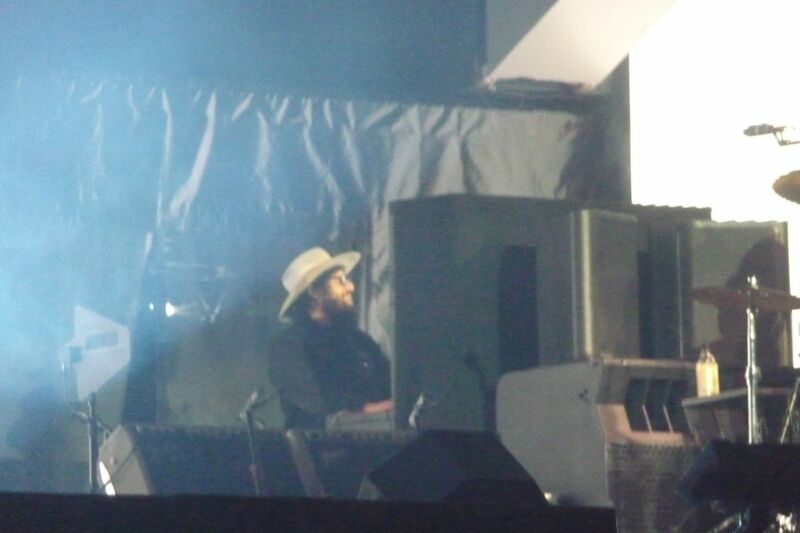 He had five pairs of eyes from the stage focused intently on him waiting for the next cue. We had years of fairly loose arrangements, close to jams. Then from ’89 we had tighter arrangements, often trying to emulate the studio recording on stage. 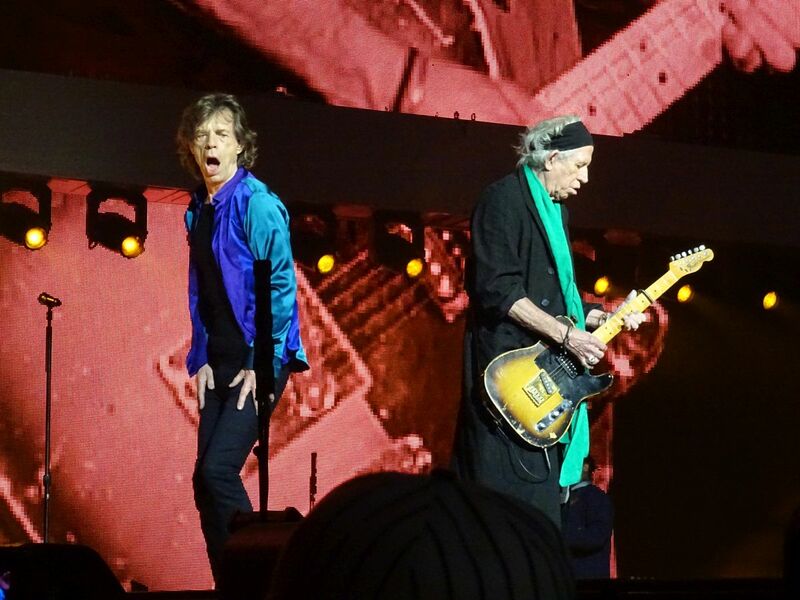 Now I feel its loosened a bit for whatever reason – and again in my opinion that’s the real Stones. The sound (again) was great, although a few times the vocals were a little slow to mix-up at the start of songs or after solos. The lighting and screens work so well, getting close-ups of up to four players at once. All the support crew are almost invisible, standing in the shadows… The sheer power of a few numbers, like Street Fighting Man, and Sympathy, and Satisfaction. Fantastic. Lots of people focus on the slips. 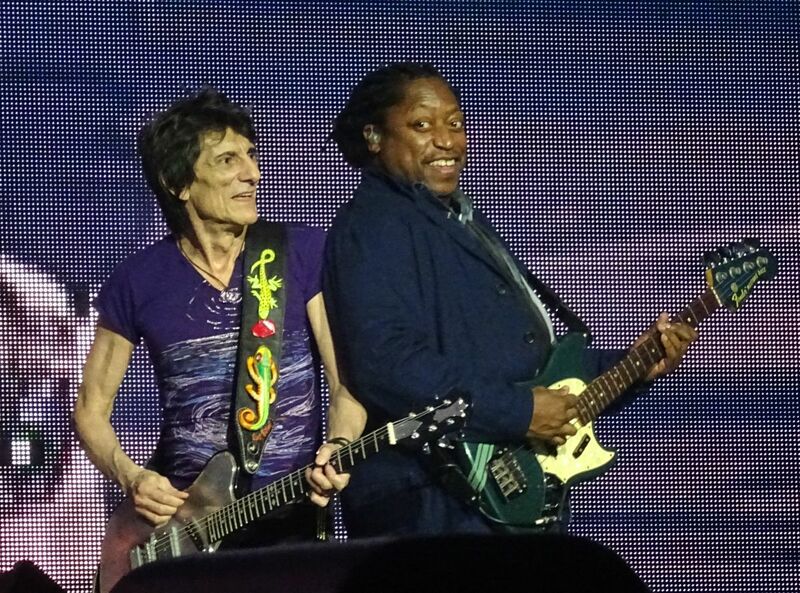 There were a couple; Mick even said “take two” as he smiled before the second start of Start Me Up. Or maybe Keith was just testing the sound. Who cares? Certainly the band didn’t seem to care – they were very relaxed and coped like the experienced performers that they are. 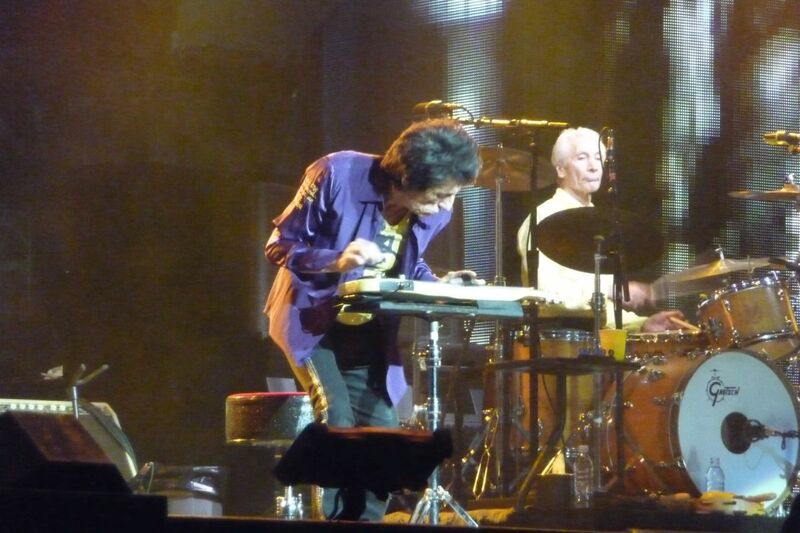 Keith’s guitar playing, and Ronnies, was exceptional much of the time. Daryl’s bass seemed to have a slightly sharper tone that enhanced his semi-solo on Miss You. Karl blew his lungs out on a couple of numbers. Tim had more than usual to excel-on, plus the “Hammond” mixed up well in YCAGWYW. Chuck’s fingers and wrists must ache after 135 minutes of playing. Matt’s keyboard I felt could have some tones changed, but added nicely to the feel. And Bernard and Sasha sang their hearts out, and Bernard and Matt added some timely percussive effects. So overall a great gig again, and a brilliant first half. Much enjoyment had by all, including it seemed on stage. 4 gigs to the end of the tour now. Our minds start thinking about 2018 and what that might hold… I’ve read that they need 10 or more shows to make the economics work, and I’m guessing that making a personal commitment to work for more than 12 weeks or so a year is not easy in your seventies. Then there is the physical toll, and emotional highs and lows, of touring and being away from home. And finally, it struck me in Stockholm, that they need a few weeks and 5 or more gigs to really slip back into smooth operation. 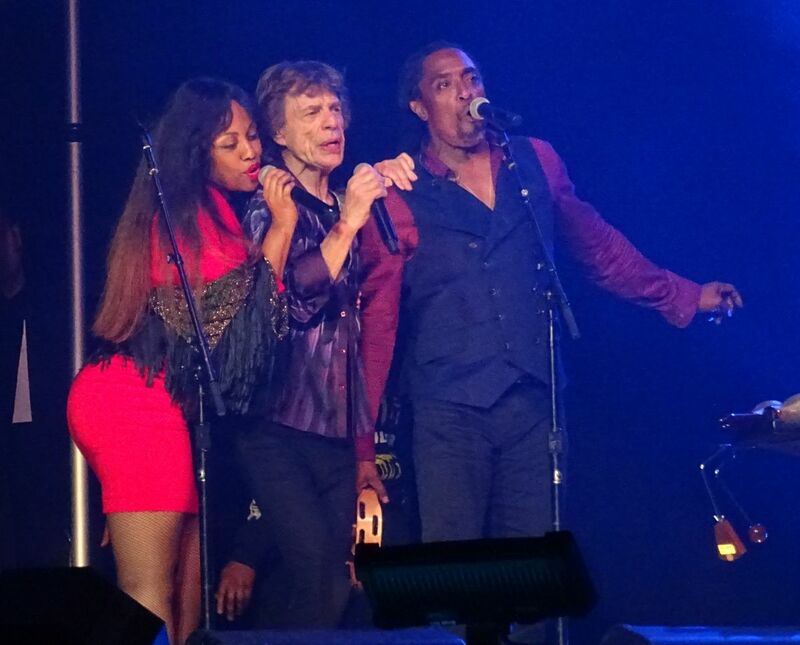 All those parts of the equation don’t balance easily – anyone with a solution please contact the Stones management! Ever have one of those days where you ask, "Why do I bother?" 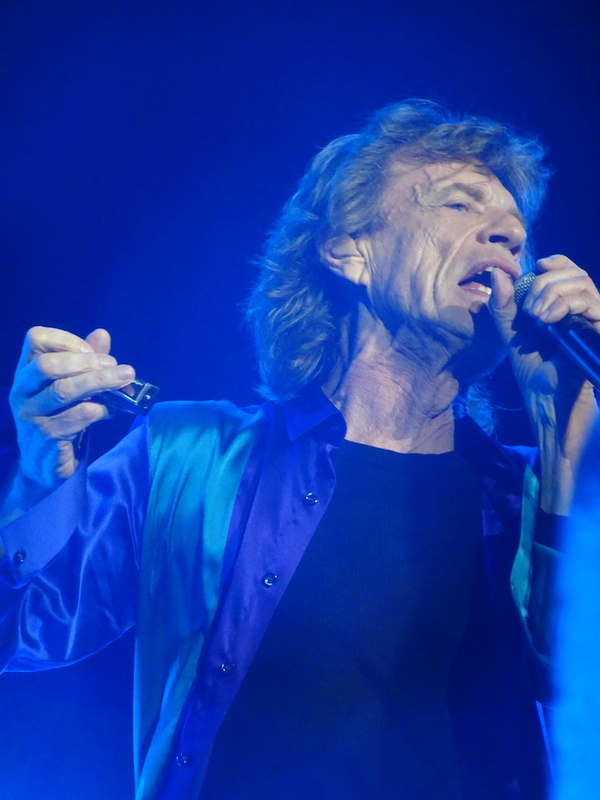 I felt a little like that at the Stones' concert in Stockholm - a gig I had been looking forward to because I've had some good times over the years in Europe's most civilized capital, and also because it would be my 250th Stones show. 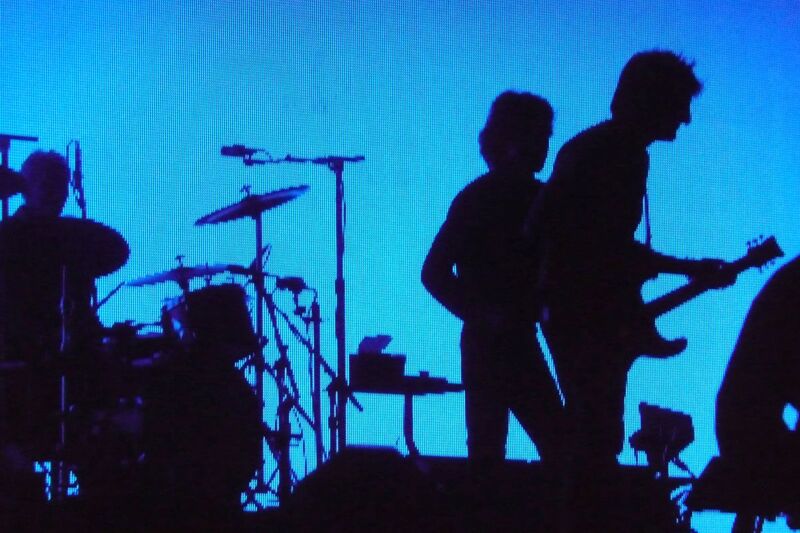 But any hopes of a spectacular gig were quickly extinguished by both a band and an audience that also seemed to be wondering in unison, "Why do we bother?" The whole experience was lackluster. 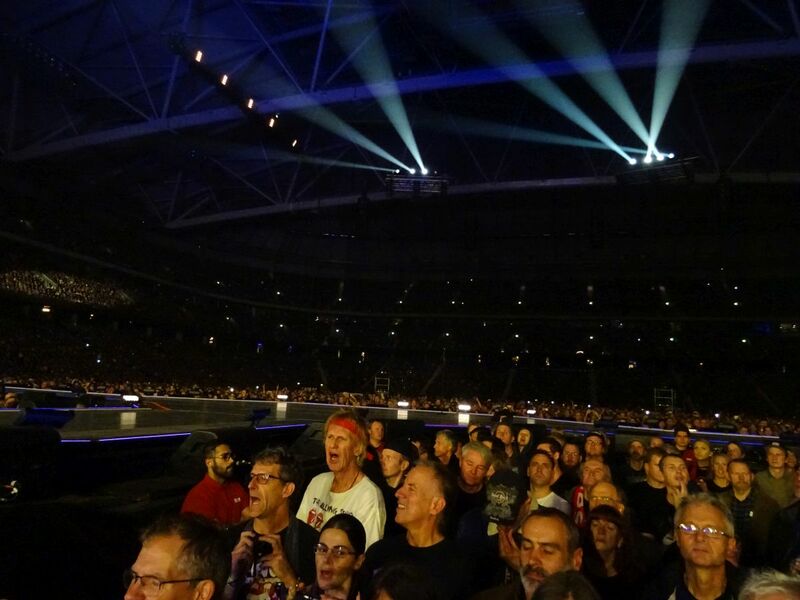 Every time I looked up to the stands at the Friends Arena, everyone was sitting down. Everyone, even during "Paint It, Black." I did spy a handful of brave souls who dared to get on their feet for "Honky Tonk Women." It reminded me of a ghastly time at Goteborg in 1998 when I got trapped in the stands with a school of Swedish cold fish, so my condolences to anyone who wanted to rock out tonight but couldn't. 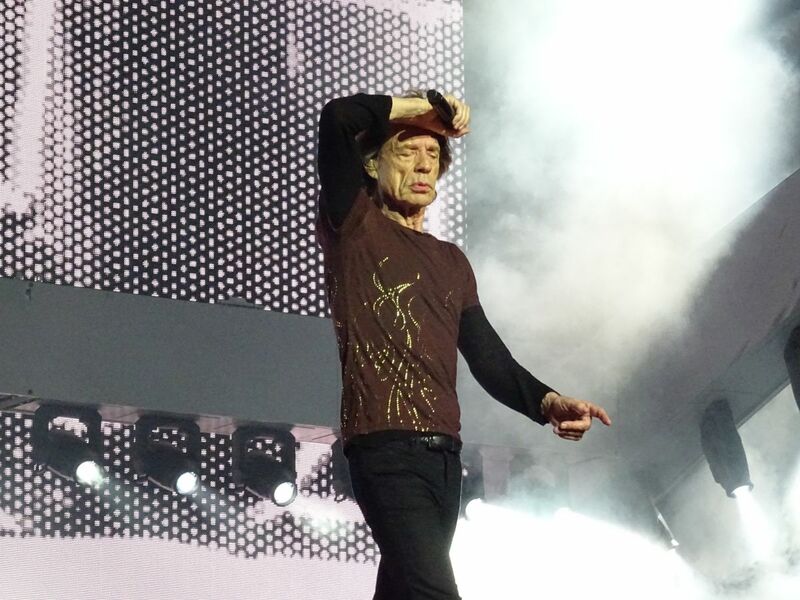 I can only assume Mick was being sarcastic when he said our singing on "You Can't Always Get What You Want" was "better than the last lot," and when he called us "crazy motherfuckers" at the conclusion of "Street Fighting Man." The Stones themselves were pretty blah. Keith was back to his old tricks, screwing up wherever possible. 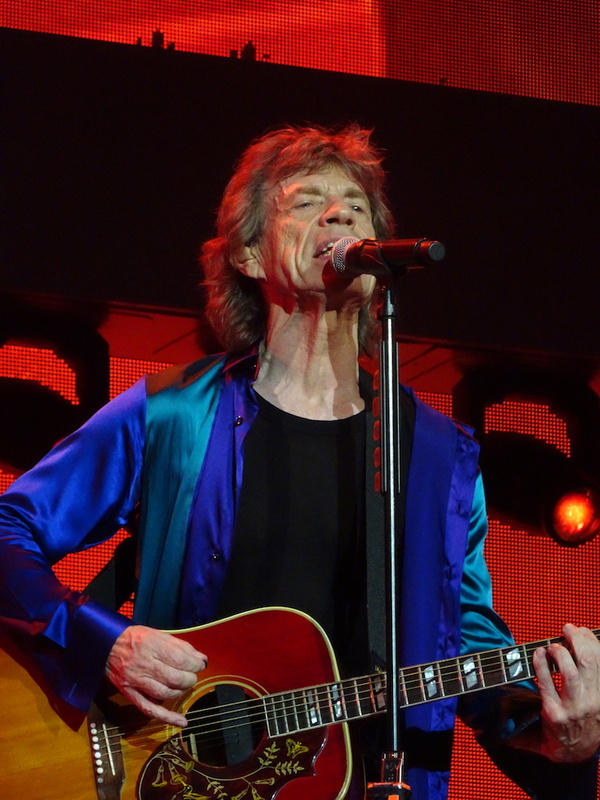 Both "Start Me Up" and "Jumpin' Jack Flash" required second attempts, or "take two" as Mick said for the former song. 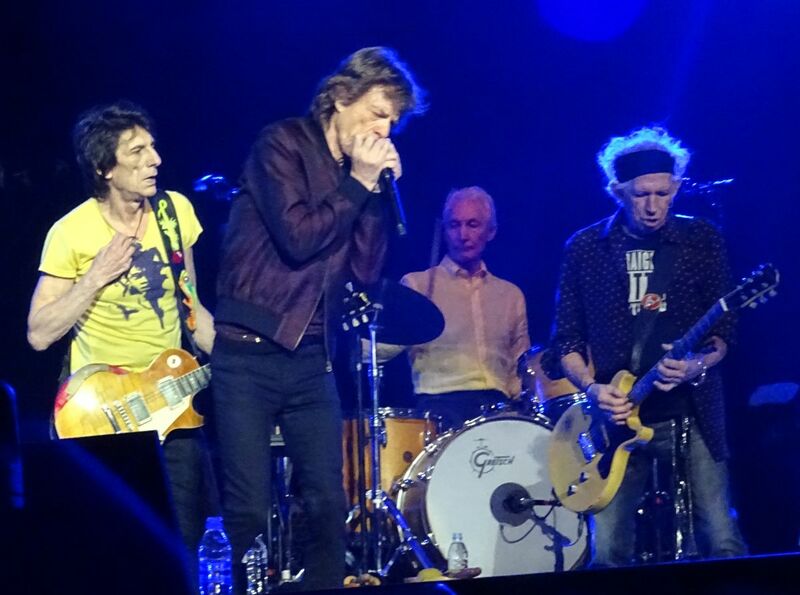 "Midnight Rambler" and "Street Fighting Man" sounded anemic, although I liked Charlie's barrage of eighth notes (? - fractions are not my strong point) during one of the "Rambler" sections. 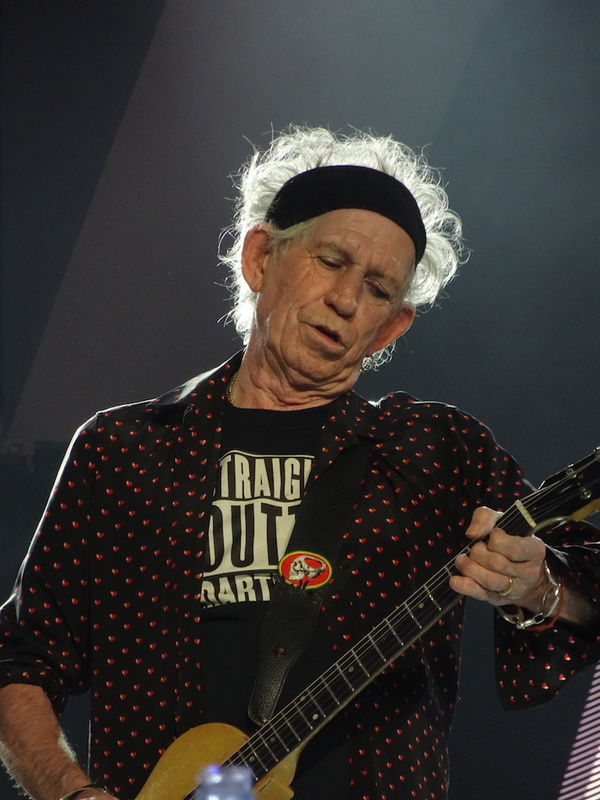 Keith's singing remains top-notch, though, and it was a tragedy to hear his backing vocals on "Sweet Virginia" get drowned out by Sasha's over-miked wailing. 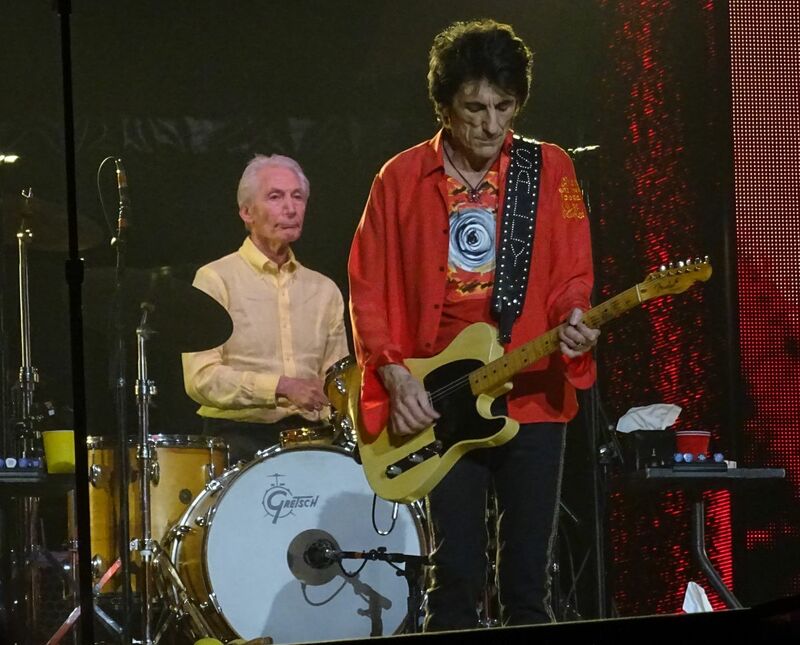 I realize there has been some debate on this, but I was surprised to see Keith sit out of view on the drum riser to Charlie's left for the first few minutes of "Miss You." I know he and Ronnie like to sit for a bit on this song, but they usually make a spectacle of it. Keith seemed to be hiding tonight. Full credit to Mick and Ronnie for soldiering on with an ailing comrade and an arena of corpses. 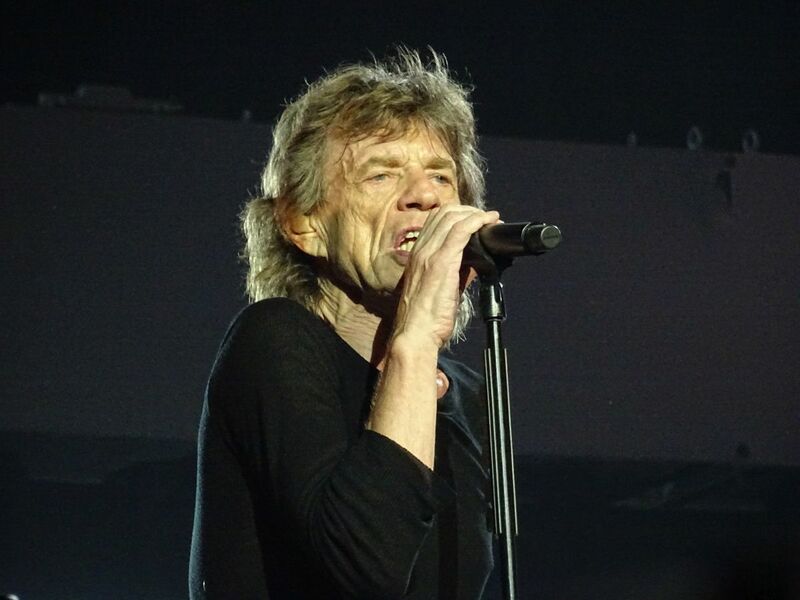 Mick asked if any members of the Nobel Prize committee were at the show, presumably hoping to get some traction for next year's literature announcement. 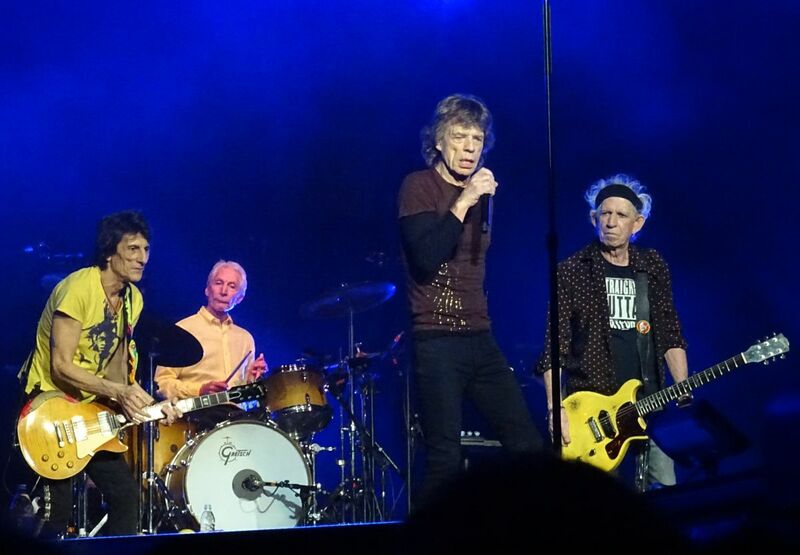 He also noted that it was the Stones' 27th show in Sweden, and he showed us a picture from their first gig. "A lot of the songs are the same, but the set is bigger," he said. He's a sucker for punishment. 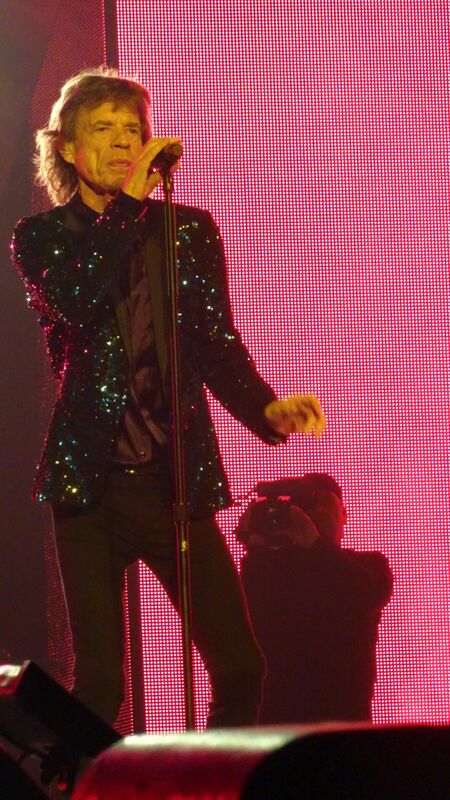 Right up until the end, Mick kept talking in Swedish despite getting no reaction. "I've got one or two phrases that you won't understand," he warned us early on. 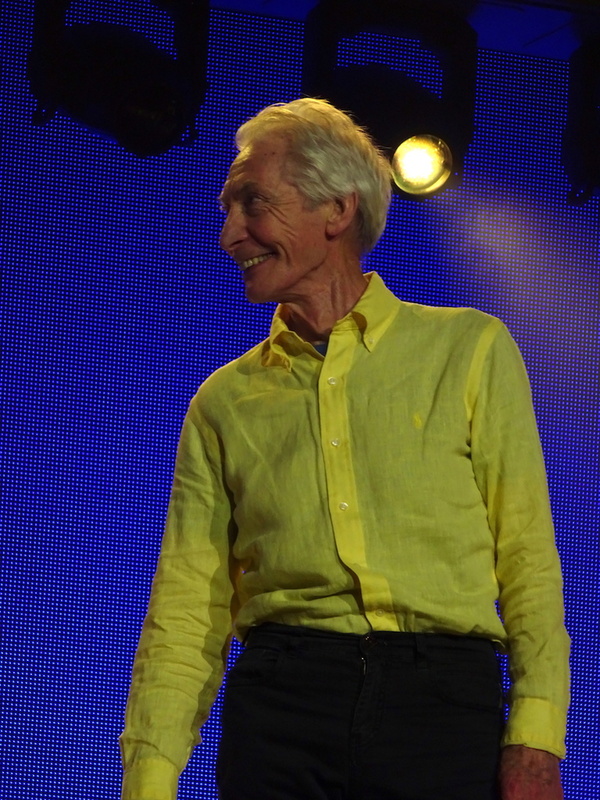 Mick ended "Street Fighting Man" behind "the crashing, bashing, dashing" Charlie Watts, where he grabbed some sticks, banged on a drum and then pretended to bang on Charlie's head. I should give a nod to Chuck for his Mike Garson-inspired "Aladdin Sane" soloing during the instrumental climax of "Street Fighting Man." Weird, but cool. Also weird is the quasi-reggae version of "Under My Thumb." I guess "Sweet Virginia" was the highlight, notwithstanding Sasha's aforementioned over-singing. "I'm not sure if we really know that one," Mick bluffed.. "Please forgive us for an mistakes ... Have a go." Of course they did fine, and here's hoping we get a few more Exile gems in the final four gigs. Yes, folks, the tour is winding down, and I wouldn't be surprised if Paris #3 is la grande finale. It's been a bittersweet tour, flashes of brilliance amid much mediocrity. 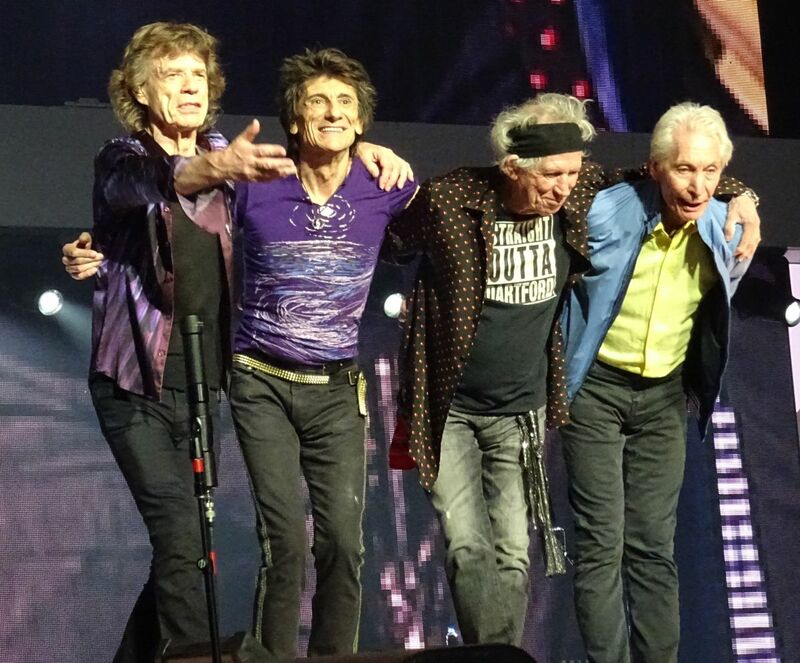 If only to justify our outrageous expenditures, we persuade ourselves that the Stones will just "keep on keeping on," and maybe they will. But be warned that it's not a pretty sight. 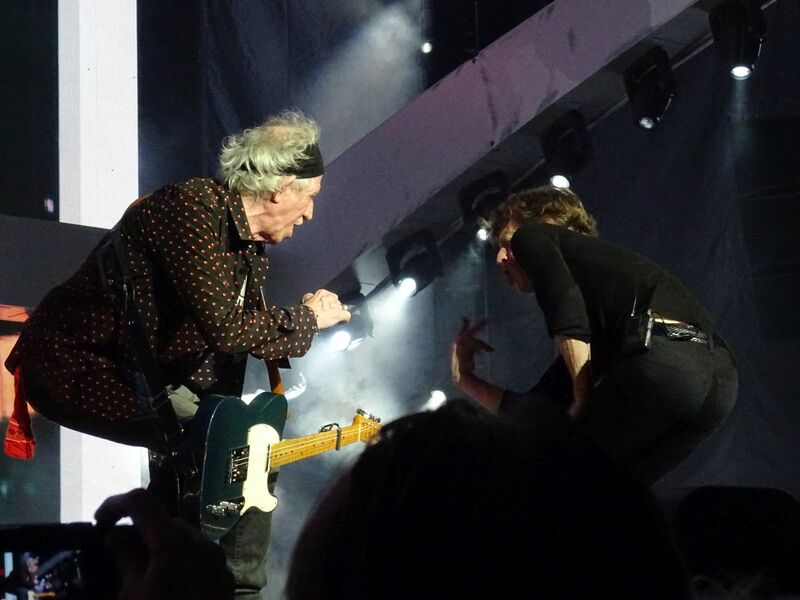 If I go to a Stones show, but don't write a report, then it is usually one out of three main reasons I don't write: (1): The show was exceptionally great, and I have problems finding the right words in English. (2): It was not that great show at all, just ordinary, so I don't want to force myself into pick something extraordinary out of the ordinary. (3): I am too busy and too tired, on my way to another show with very few sleeping hours. Many have asked why I did not write any reports from the shows in Lucca and Copenhagen. For those shows, the answer is easy. It was the first category, great, highly emotional shows. 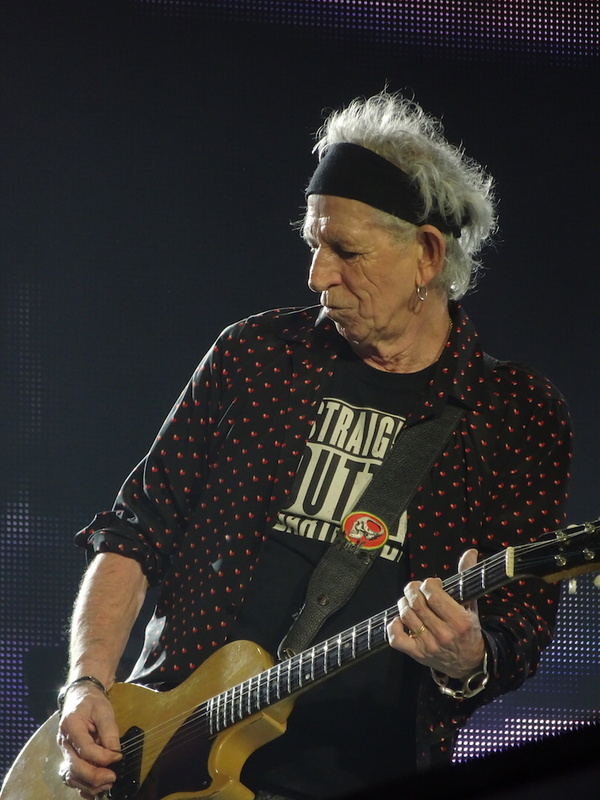 "Con Le Mie Lacrime" in Lucca, with Keith sitting with his 12-string acoustic guitar right next to Charlie, such a great show and atmosphere. I just loved it, I was out of words. Same with Copenhagen. I came from a fantastic show in Amsterdam, one of the best of the tour, and I had such a great performance in Copenhagen, an 8 out of 10 sort of experience. Again, I was out of words. The Stockholm show was weired. I mean the show was great, but I did not hear the crowd. In Düsseldorf there was a big roar from the crowd from start to finish, lots of excitement in the air, and that excitement in the crowd is feeding back to the band. In Stockholm I thought it was quiet until the first encore. 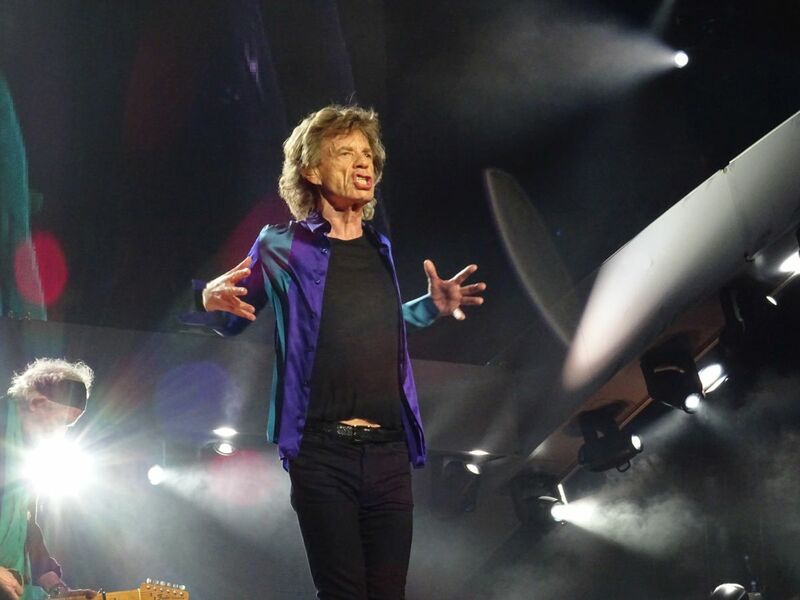 It was sort of late having that crowd reaction with "Gimme Shelter", with just two songs remaining in the set. 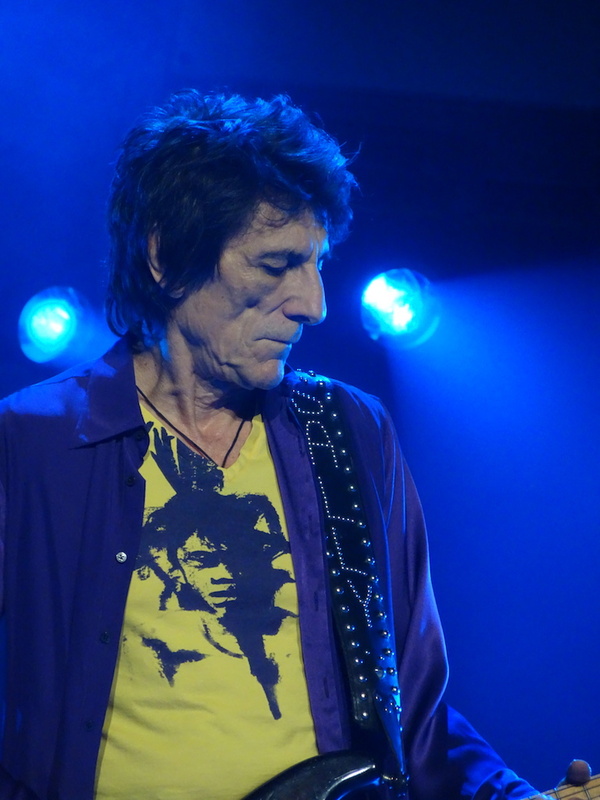 Still, I will agree with the report in "Aftonbladet" - "Midnight Rambler" and "Street Fighting Man" were so powerful, intense and rewarding, Keith so strong on his riffs, and I was inside the Stones bubble for those moments, even if I did not feel any reactions from the rest of the crowd. Sure those songs were 5 out of 5 for sure. But still, it is all in your mind. May be I was in another land, they did a great show. I talked to three young Norwegian fans I met at the Arlanda Airport, they on their way to Bergen/Stavanger, I on my way to Amsterdam/Arnhem, we all agreed the show in Stockholm was just as good as they were last time ten years ago in Oslo, may be even better. 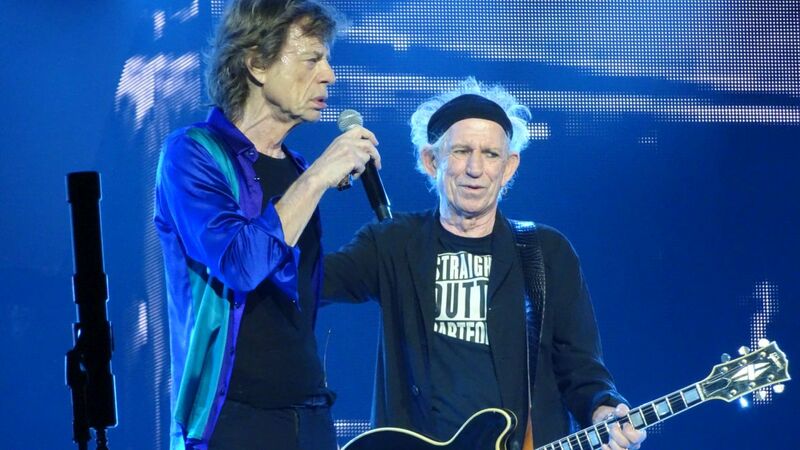 And we could not understand why some journalists in Swedish press said it was time for the Stones to call it quits. I am just spoiled with the shows peaking in Lucca, Amsterdam, Copenhagen and Düsseldorf. So may be Stockholm was 6 or 7 out of 10, who am I to judge every show? 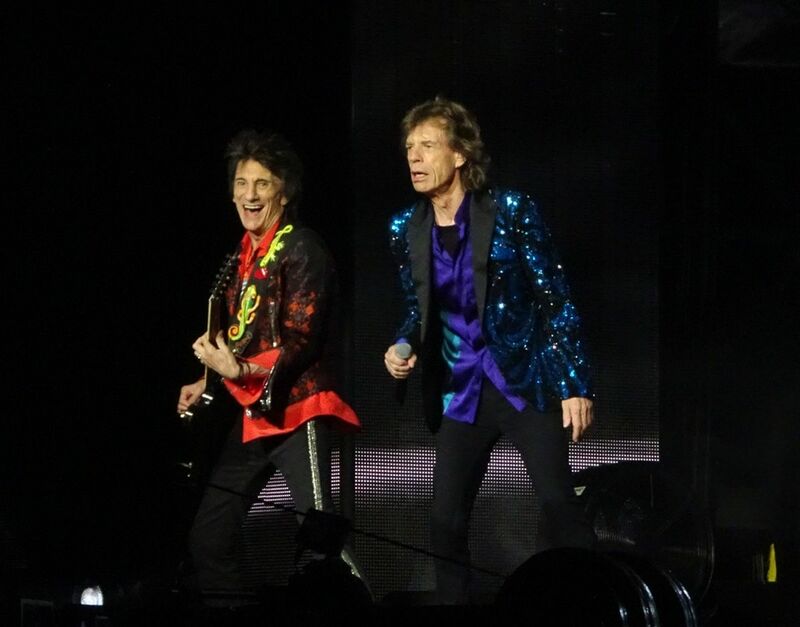 This was only my second Stones concert, the last being their last Australian tour many years ago. I was very impressed by the performance of these now elderly men. Such a great energy and passion for the music in all of them. The songs were great. And very memorable. I just wish they had included one more off Some Girls. And perhaps a couple done as a quieter acoustic set - maybe Angie or Wild Horses? Or Love in Vain. I guess i have really enjoyed their live albums, and have grown to love songs such as these. 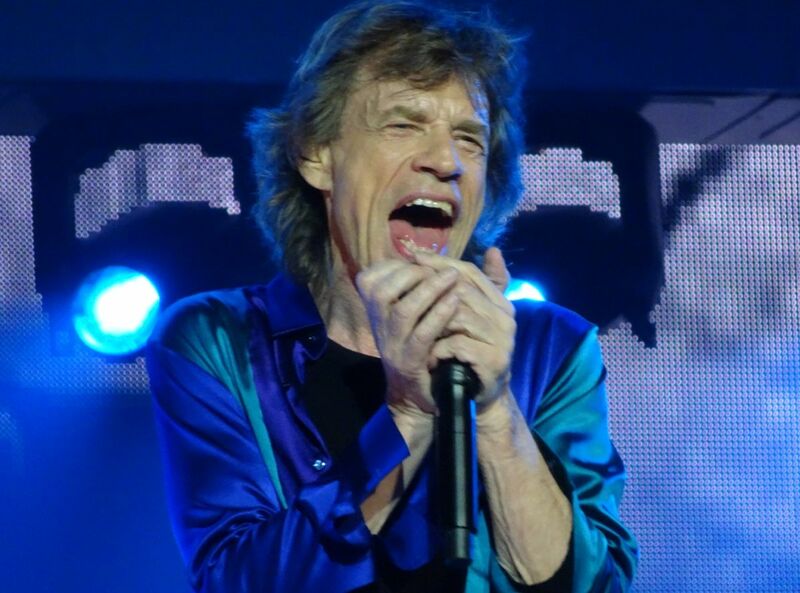 Another live favourite is "Around and Around" and "Little Red Rooster", off the Love You Live "El Mocambo" performance. But nonetheles, we still had a great show, and loved being their to enjoy it. This was only my 3rd Stones concert ever... The last one being in Stockholm 2014, but this show was definitely better. 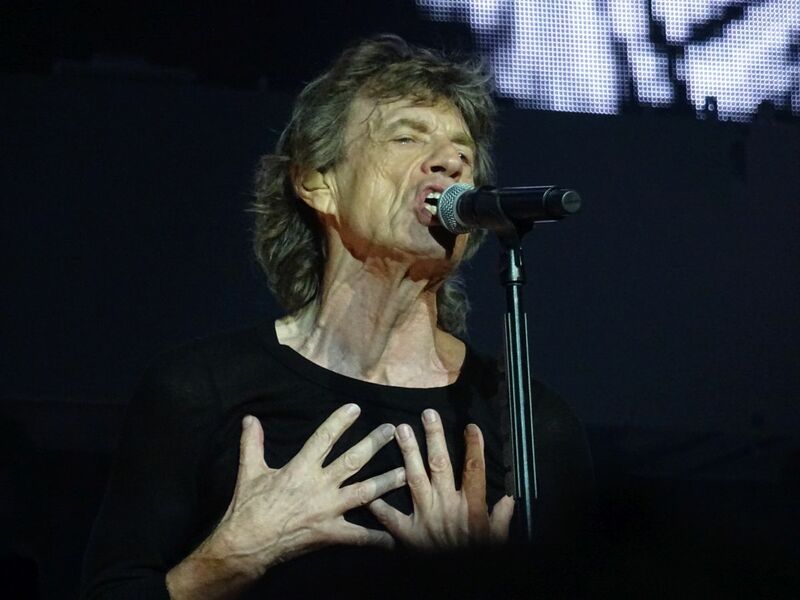 Under My Thumb was worth the admission alone, a fantastic version very reminiscent of the studio take, it's amazing how Jagger can still sing this well at the age of 74. Street Fighting Man is such a powerful song, and Start Me Up together with Brown Sugar really had a nice groove going on, something which just wasn't there in 2014.